My friend Dave Ratajczak died last week. I didn’t know he’d been sick; in fact I haven’t seen him since a few years before I moved to LA, and that was more than a few years ago. He was one of those guys who, and I know you know the type, you say “oh yeah, Dave–great guy, great friend!” despite the fact that you haven’t really been in touch. Of course now I regret not having been in touch. When I arrived at Eastman back in the day, Dave was ‘the’ drummer. He was already an icon. He played with intensity and passion, but also with a jaw-dropping accuracy, not just technically accurate, but musically accurate…he always seemed to play the right thing, and he nailed every single piece he played. And he played a lot of them. He was the guy in the reading bands, in the #1 jazz ensemble, the studio orchestra…he was the guy on everyone’s recitals, on all the concerts…I must have heard him play hundreds of others’ pieces, and he read down many of my new works in classroom reading sessions and in Ray Wright’s legendary Saturday studio orchestra reading sessions. He nailed everything. Never f’d up once, I swear. Dave, and the other Dave, Ed, Lee, they were like the A-Team…I don’t know who was Hannibal, who was B.A….they were unassailable. 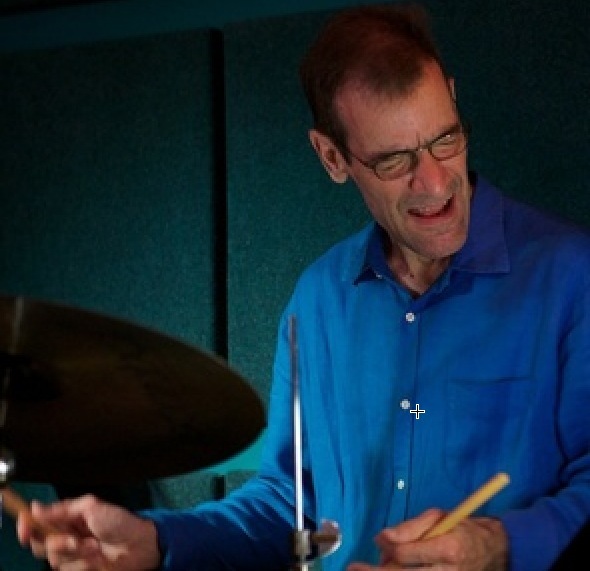 When I moved to NYC in the 80s and started doing writing and playing gigs, Dave had been busy freelancing and establishing himself for a few years…first on the road then in town…again, he was ‘the guy’…and one day I needed a drummer for an out of town jazz gig, and I tentatively picked up the phone and called…”ah, you probably don’t remember me but…” etc, etc… I was so happy when he said resoundingly “of course I remember you…” and “I’d love to do your gig.” And he did it, and it was great. He was so much better a player than I, and he made me sound good. Then I used him in my nonet, gigging around town, then I recorded a demo with the group, then a few years later I used him on my first ensemble record. After that we kept in touch but didn’t play out a lot cause he was doing shows and touring and I was doing Conan and my own thing producing and gigging. There were a few sessions where he and I were sidemen, like jingle dates and demo dates for artists, and I had the opportunity to use him on a few sessions that I produced. Dave was the kind of guy who was so nice, that I, who isn’t so much like that, had a hard time believing that anyone could be so nice. What, no artifice? No schtick? No sarcasm? It’s disarming. But once I got used to it, his genuine warmth was consuming. If you take my relatively limited experience with Dave Ratajczak and multiply it by the probably thousands of people he knew and performed with, think of the wealth of great music and great vibes he created–all that stuff followed him around, spreading through the ether–a legacy of coolness and great music disseminating exponentially through the community. I’m posting here two of the many tunes I recorded with Dave. His playing on my piece “Three by Five” from my record Song Without Words is one of those jaw-dropping feats, where he takes a very difficult chart and plays it like he’s teaching it to you–your own piece–he knows it better than you. I still listen to him play on this chart with amazement and reverence. The other is from a session we did for saxophonist Bob Magnuson, again one of my tunes, this time a smaller group, and g’damn if he wasn’t holding the whole thing together that day too! Dave, I miss you, and I am certain I’m one of the only cats who can constantly spell your name correctly, having had to print it a bunch of times on school programs and album covers. R A T A J C Z A K —- jeez — don’t leave out the “J”! !